The rates for government-backed student loans — known as Stafford loans — are set to double today after lawmakers on Capitol Hill failed to reach a compromise for heading off the increase. An estimated 7.4 million university students will be affected and the added cost for the average borrower will be $2,600 over 10 years, according to the congressional Joint Economic Committee. 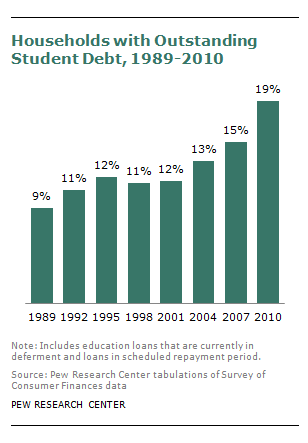 The weight of debt from college loans has already made a substantial impact on U.S. households. A Pew Research Center analysis of government data that became available last year found that 19% of the nation’s households owed student debt in 2010, more than double the share two decades earlier, and a significant rise from the 15% that owed such debt in 2007, just prior to the onset of the Great Recession. A record 40% of all households headed by someone younger than age 35 owed such debt, by far the highest share among any age group, the analysis also found.